"By doing your homework and gathering the necessary information, you're heading in a direction all successful companies take - a customer-centric, data-driven approach to doing business." Every entrepreneur knows that at one point in their sales pitch, a question or two about their competition will inevitably pop up. A great idea for a startup and a winning team are all fine and dandy, but the buyer-to-be will be largely more interested if you understand your competition and your position in the market. Just like making sure you have a product market fit for initial startup sales, differentiating your startup is crucial, not just by content but also by context. 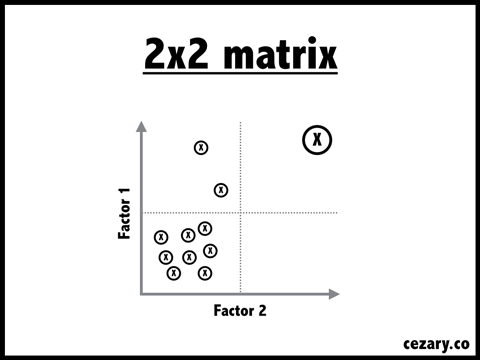 You’ll often find advice on the way you should dissect your competitive landscape, be it with some form of a 2x2 matrix, Steve Blank’s petal diagram, or else. You need to have a keen awareness of the environment in which your startup operates and that includes knowing your competitors, their clients, and the technologies they use to solve problems. How do you do that? There are a few ways but we can only vouch for the one tool we know that works - SimilarTech’s Sales Insight Platform. We crawl and analyze millions of websites daily (over 317 million, to be more precise), collecting mountains of data that we shape into easily digestible insights so that you may grow your business efficiently and effectively. Let’s get this show underway and see how we actually do it. That’s your competitive landscape right there. We’ll take the number three option on the menu - VigLink, as our example technology to focus on. Let’s say they are of particular interest to you so you want to get to know them a little better. As you can see, they’re just shy of the 850,000 mark when it comes to websites using this technology. One click and you get information regarding its market share and usage statistics, coupled with company description and other details. Further down, you get a list of related technologies to compare against, as well as a list of top 10 clients and geographical hotpoints where VigLink is most used. This is a rather useful source of knowledge to get a scoop if a website is using a competitor’s product or if they have a tech stack that just might get along with your technology. Those would be the initial steps toward understanding your competitors so you don’t put yourself in a situation thinking your idea/service is unique or that only you can do this or that. Competition is everywhere and there are more than enough correlating technologies that can easily overlap yours (more on that later on). Right now, you’re on the right path. Let’s keep on to more advanced insights and where things get really cookin’: creating a report. Company filters - geographical coverage, employ and revenue range, etc. As you can see, you get lots of goodies here. There’s the breakdown of the companies using this particular technology, which enables you to better grasp whom and what you’re up against. You can correlate this data with data on your existing customers, as well as get a scoop on companies that you haven’t reached out to but definitely should. Speaking of correlation, you also get the benefit of finding out which correlated technologies these potential customers are using. That way, you can expand your initial focus and turn to discovering your greenfield opportunities regarding new business verticals, technologies and geographies to exploit. In addition, you can uncover all of the technologies a website is using and see their tech adoption history. Gaining a thorough understanding of the technology stack that powers a website infrastructure is another powerful source of insights that can benefit you in multiple ways: help with prospecting and client research, as well as grant you the ability to really see what’s ‘under the hood’ and personalize an offer that will check all the boxes. Finally, there are real-time alerts designed to equip you with on-the-spot knowledge when a prospect starts or stops using a specific technology or platform. The minute this happens, you can reach out and contextually explain your value proposition, why your technology is the right fit for them. For startup owners out there, the sales pitch is practically everything. Simply put, you need to look under and turn over every rock to find your competitors and gain a sense of the landscape. By doing your homework and gathering the necessary information, you’re heading in a direction all successful companies take - a customer-centric, data-driven approach to doing business. With this post, we’ve shown you how easy it actually is. You’re at the crossroads and SimilarTech’s Sales Insights Platform is the road sign pointing you to the promised land. It’s up to you to choose which way you’ll go.